Home » Food » Adam’s Ribs? Now that we’ve crossed into spring and the weather seems to be easing it’s grip on winter, my mind turns outdoor entertaining. One of my favorite things to make on the grill are dry-rub ribs. ground cumin, smoked paprika, garlic powder, onion powder, chili powder, kosher salt, cayenne pepper, black pepper, white pepper, brown sugar. I combine equal amounts of the spices in a large bowl and then add about 1/2 cup of brown sugar. Make sure you mix it really well. Next you need ribs. It’s important to choose good quality ribs. Personally, I prefer pork ribs, but you can use beef if you like. Look at both sides of the ribs, you want to find a slab that has a good amount of marbling of fat down in the meat without a lot of large fat clumps on top of the meat.. also the whiter the fat the better it is. A good butcher can help you choose the best rack to buy. 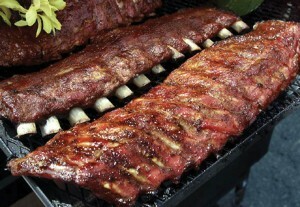 Pork and beef spare ribs need to cook long and slow to tenderize, pork baby-back ribs don’t need as much cooking time. Some people like baby-back ribs for their ease, but the amazing tenderness of slowly cooked spare ribs coupled with that great bone is my choice. If you have access to a smoker, you may want to smoke the ribs, long and slow to infuse all the spicy goodness. For those of us who do not have all the backyard bells and whistles of a gourmet outdoor kitchen, I’ve found that you can achieve the same flavor by following a few simple steps. Rinse the ribs and pat them dry. This removes any impurities that may be left over from the butchering process. Rub both sides of the rack with your dry spice mix, put on a large platter or in a shallow roasting pan, cover with foil and let sit in the refrigerator overnight. That’s right, a good 12 hours really allows the spices to penetrate the meat. About an hour before you plan on cooking, take the ribs out of the fridge and allow to come to room temp. You can add a smoky flavor by using damp wood chips in the final grill phase. I guarantee that your friends will be licking their fingers and singing your praises with this recipe. I’d like to thank the Willamette Valley Vineyards for the image of ribs. Their wine goes really well with ribs or any kind.